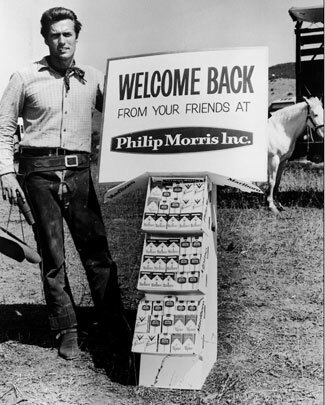 Philip Morris welcomes Rowdy Yates (Clint Eastwood) back for another season of “Rawhide” and we welcome you back to the 100th gallery of Western Treasures! 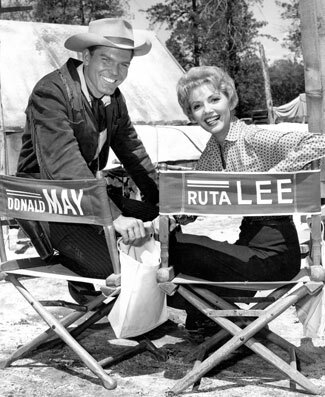 Some 2,500 rare Western photos for you to enjoy! And more to come. 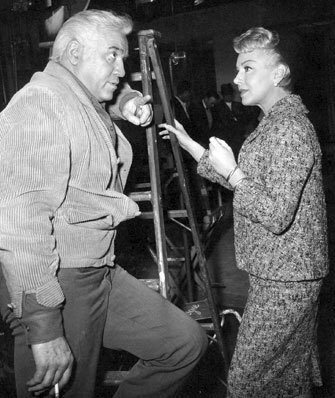 Charles Starrett proves there’s no “fighting like cats and dogs” here. 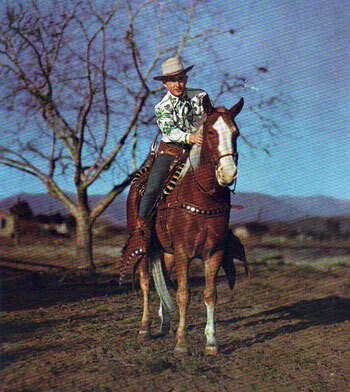 Makes you wish Jimmy Wakely’s Monogram Westerns had been in color. California! Lucky! Bring Hoppy his six-guns! 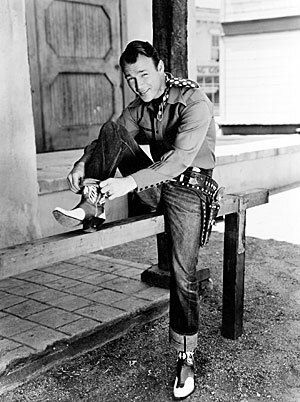 Roy Rogers tries on a brand new pair of boots. 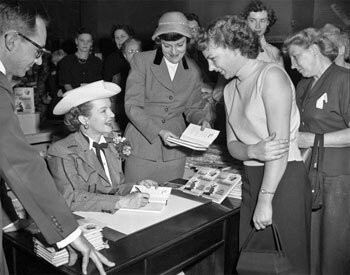 Dale Evans signs copies of her book ANGEL UNAWARE in L.A. in 1953. 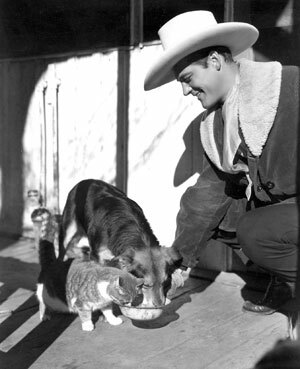 Ray “Crash” Corrigan on location for “The Painted Stallion” serial (‘37 Republic). 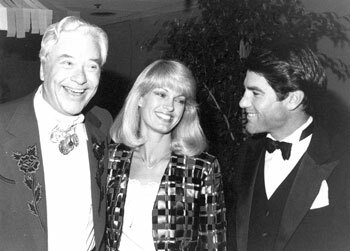 Monte Hale with L.A. Dodgers First Baseman Steve Garvey and his wife Cindy. 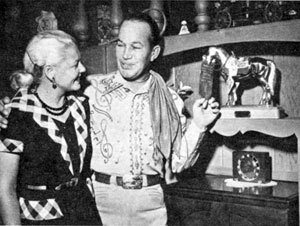 Western bandleader and minor B-Western star Spade Cooley and his wife Ella May keep all of Spade’s plaques and momentos in the den of their ranch house. This photo is from mid-1952. 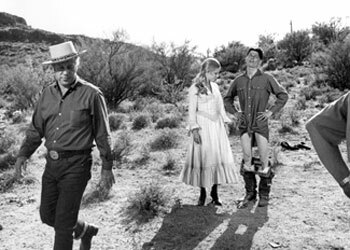 Director Budd Boetticher sets up a scene between Anne Randall and Richard Lapp for “A Time For Dying” (‘69). 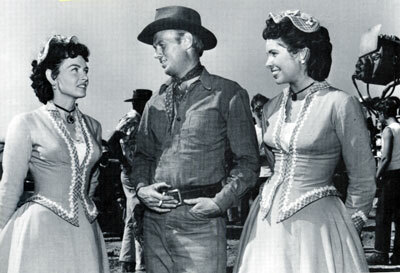 The seldom seen film featured a cameo by Audie Murphy. 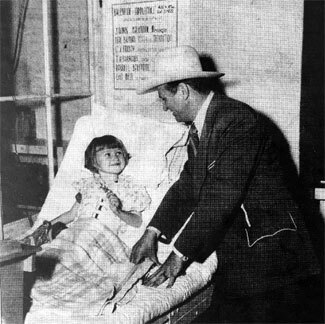 Gene Autry visits Comstock Children’s Hospital in Tucson, AZ in the early ‘40s. 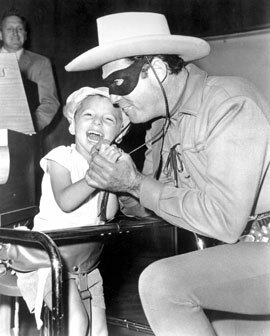 The Lone Ranger (Clayton Moore) visits a disabled children’s hospital. 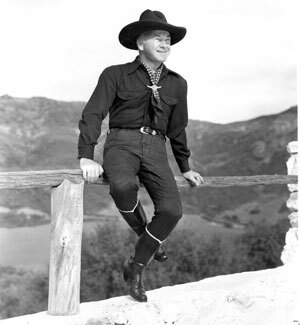 George Montgomery was one of the stars of the Republic serial “The Lone Ranger” in 1938. 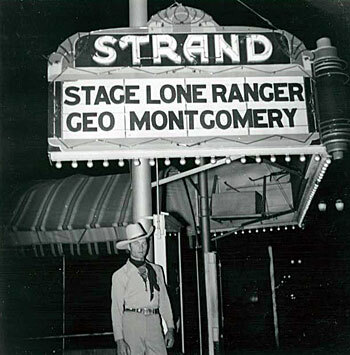 Here he makes a public appearance at the Strand Theater in California in 1941. 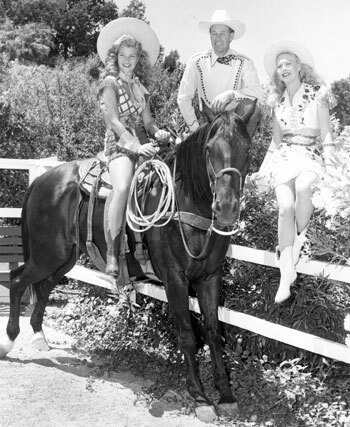 Gail Davis heads for another day of work as TV’s “Annie Oakley”. 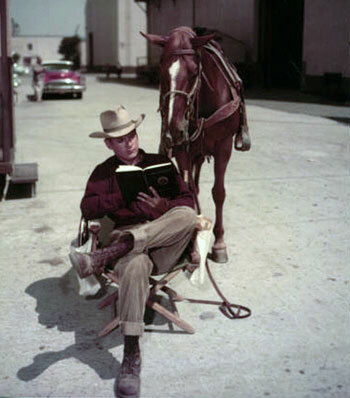 Will Hutchins and his horse Penny study Will’s next “Sugarfoot” script on the backlot of Warner Bros.
Donald May and Ruta Lee take a break from filming “Colt .45: Showdown at Goldtown” on the Warner Bros. backlot. 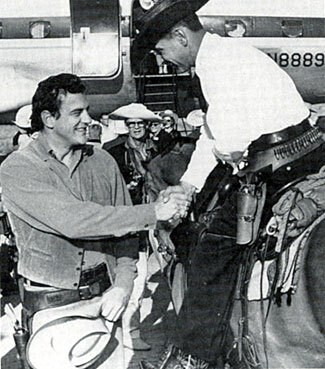 James Arness as Marshal Matt Dillon is greeted by Deputy U.S. Marshal Ramon K. House of Dodge City, KS in 1958 during the dedication of Front Street. 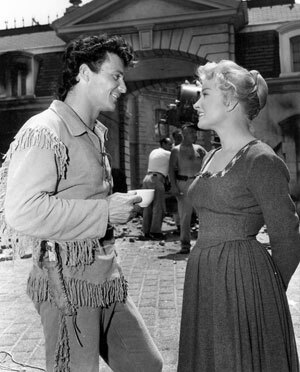 Keith Larsen and Carol Ohmart take a break from filming a “Northwest Passage” episode. Both were born in Elias Hospital, Salt Lake City, Utah but had never met. 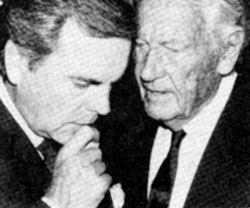 Robert Wagner and Joel McCrea in deep thought over ??? 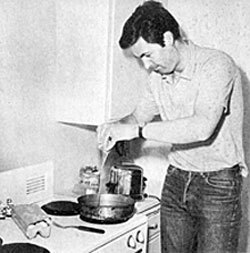 “Daniel Boone’s” Fess Parker whips up scrambled eggs for breakfast. 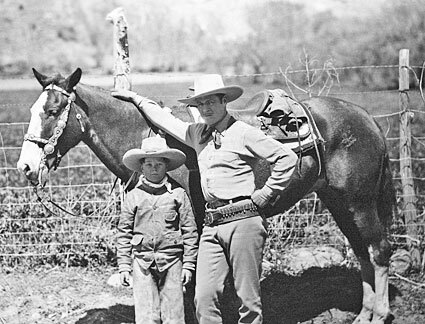 Jack Holt in the mid-‘20s with future B-Western star, son Tim Holt. 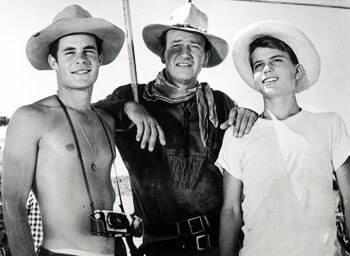 Sons Michael and Pat join Dad on the set of “Hondo” in 1954.